Long before I started travelling I came across the Moleskine Calendars, which I adore, because they help me plan better and get an overview about what’s going on!
. I like to add a bit of my personal touch, this is why you’ll find the stickers all over. Per year I have one and the stickers help me distinguish them when I go back and look for information or just get my mind off and dive into my thoughts from back then. I really like how much stuff you can put in there!! One of the best things of this notebook is that it has a pocket at the end, where you can keep important documents. When I plan a trip I usually grab this notebook and write all destinations that I want to cover for the next trip(s). I write almost everything in it, so I don’t depend on having any extra copies of tickets etc. I also print out maps and the month I’ll be travelling and glue them in. If I have more than one upcoming trip I write one trip in the usual way in it and then I turn the book around and start from the end of the book, so I’ll have all the space I need for planning a trip and don’t have to go back and forth for the same trip. Sometimes when I travel I feel the urge to write something down, just for me – I also use the very same notebook for this purpose, so when I open it again and go through the pages I know where I was at that moment and probably what was so special about that trip. Google calendar: because it simply syncs to all my devices. Evernote: Love this tool, you simply type your notes and it allows you to keep your ideas organized in different notebooks and the really cool thing is the notification option. Let’s say an amazing idea popped your mind, but right now you don’t have the time to get into it. Set the alarm and you’ll work it out later! This is available for most mobile devices and as desktop applications! 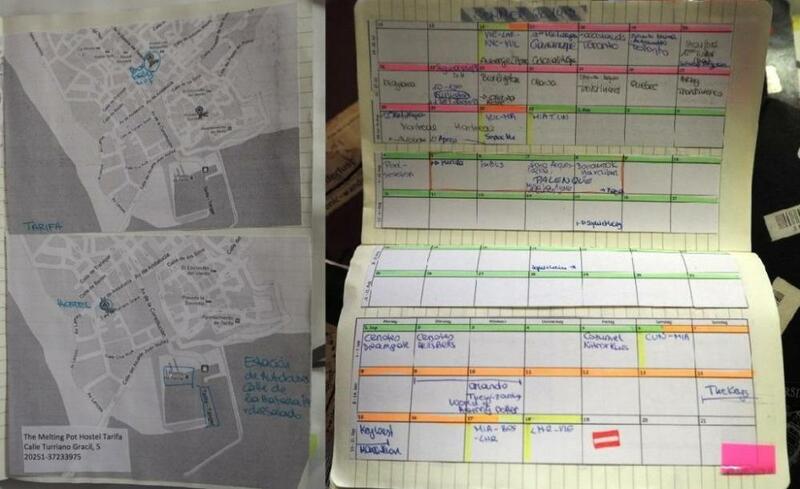 What kind of tool do you use to plan your travels and keep yourself organized?